The horrors of a centuries-old mechanized war displayed in stunning high definition. What feels like the 5,000th animated iteration of one of Hasbro’s most successful toy lines will see its second season arrive on both DVD and Blu-ray this month. 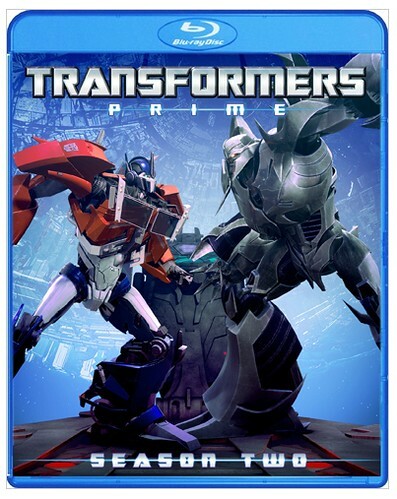 The Emmy Award-winning Transformers Prime offers stunning computer animation and a tremendous voice cast featuring Ernie Hudson alongside longtime Transformers mainstays Peter Cullen and Frank Welker and was created by Roberto Orci and Alex Kurtzman, the writing team that brought us the shockingly terrible Transformers feature films. Unlike the movies however, Transformers Prime gives us an intelligent and somber look at the centuries-old battle between the Autobots and Decepticons while giving the characters a new lease on life. Season two picks up right where season one left off, with Transformers leader Optimus Prime’s memory erased. Easily swayed by Megatron’s charisma, Prime (now known by his pre-Prime name of Orion Pax) joins the Decepticons in the war against the Autobots. Three episodes later, the problem is solved and we’re on our way through a 26-episode season that focuses primarily on the discovery of ancient Cybertronian relics and more clues to the long and storied history of the Transformers’ home world. Battles are waged, new characters are introduced, bonds of friendship and animosity are both born and strengthened in combat, and all sorts of lessons are learned. And through it all, Optimus Prime makes all manner of stoic and inspirational speeches, speaking very slowly in a low and monotone voice which illustrates the grave nature of his words. I wasn’t an easy convert to this series. Having seen the commercials and been impressed with the animation, I wanted to like the show, but I never seemed to be able to catch a full episode or view them in any sort of order that made sense. Finally getting the opportunity to sit down with an entire season, I’m happy to say that for the most part, I have enjoyed it. Unlike the Transformers series I grew up with, there’s a lot of depth to these characters and an actual sense of danger to the war they’re engaged in. There’s a continuity that runs through the series as well as character growth displayed after each incident, rather than the return to status quo that takes place at the end of each 22-minute installment, which most animated series give us. In addition to the Autobots and Decepticons, we are also introduced to an expanded cast featuring government officials that the Autobots have teamed up with, a group of kids who act as “tour guides” for the friendly robots in order for them to learn more about the planet on which they reside, and MECH, a clandestine organization who will stop at no end to discover all of the Transformers’ secrets. Despite the presence of human teenagers, we are not given the typical “boy and his ‘bot” story we got in the recent Transformers movies; the emphasis here is placed squarely on the Transformers. The animation is nothing short of spectacular. Featuring a 1080p/1.78:1 picture and 5.1 surround sound, Transformers Prime is a show that was absolutely made for Blu-ray. The music and sound effects are amazing and I can not stress enough how incredible this series looks. The Transformers are highly detailed, with a variety of gears and pistons on display (though not as messy or jumbled-looking as their film counterparts) as well as a level of wear and tear typical to most cars that have seen their share of mileage or interstellar combat. The battle scenes are choreographed well and for the most part, the design work on the Autobots and Decepticons looks great, bordering between realism and exaggerated charicature. I wish I could say that the show was flawless, but I cannot. Despite all of the great things I have to say about it, the truth is that Transformers Prime is definitely an acquired taste, with a fair number of the episodes feeling flat and almost boring. Even when the scripts are top notch, the show tends to get very talky and repetitive, with Optimus Prime and Megatron falling into a familiar pattern of giving what feels like the same speech over and over again. It’s great to see Prime featured as a no-nonsense, stand-up kind of guy who never backs down from a fight and does whatever he can to ensure that no lives are lost and that the cause of good is always furthered, but at times it just...gets...old. The same goes for Megatron and his never-ending monologue-ing. It’s wise for the writers to give Cullen and Welker a lot to do, but too often, they just fall into the same patterns. It even extends to the rest of the team, to the point that it occasionally threatens the show’s credibility. We know that Optimus Prime is the backbone of the team as well as its heart, but when he is removed from play, the rest of the Autobots fumble around as though someone transplanted Edith Bunker’s brain into a team of mechanized warriors. They’re absolutely worthless without him and rely on a team of children to inspire them to carry on. It makes a nice point about friendship and bravery, but are you honestly going to tell me that a team of robots who have been waging a war for over 1,000 years need a 13-year old to inspire them to keep fighting by relating his story about climbing a rope in gym class? Admittedly, I’m being overly cynical here, but it was a bit much. And speaking of the humans on the show, I have to admit to being a bit put off by their design. While I was impressed with the look of the Robots in Disguise, I found the humans to be just a bit too much on the cartoony side and it took me out of the story on several occasions. On the whole, the majority of my complaints might be chalked up as nitpicking, but in closing, I must again stress the “acquired taste” nature of the program. Transformers Prime can be a tough nut to crack, with seemingly slow-moving plots and an overall lack of whiz-bang adventure, but when one takes the time to sit down with the series as a whole, a rich tapestry is revealed. This is a more mature series focusing on the relationships between friends and enemies and the long-term cost of a war waged between opposing forces of gigantic, organic robots that can transform into vehicles and operate among us undetected. The Blu-ray features some neat extras including interviews with the creative team as well as a panel from the 2012 San Diego Comic Con with Larry King and Peter Cullen.